An old sorority sister is trying to find a new home for a stray schnoodle who followed her home a month ago. He’s a year old, potty-trained, and apparently very love-able. He’s the cute little guy in the bottom left side of this photo. 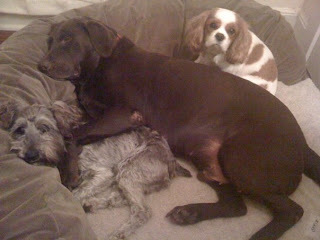 I just love that he’s cuddling with her other two dogs.